After many quarters of waiting for the Federal Reserve's interest-rate hikes to hit deposit betas, banks are now seeing consistent funding pressure and shifts in their deposit mixes, trends that are expected to stretch into 2019. 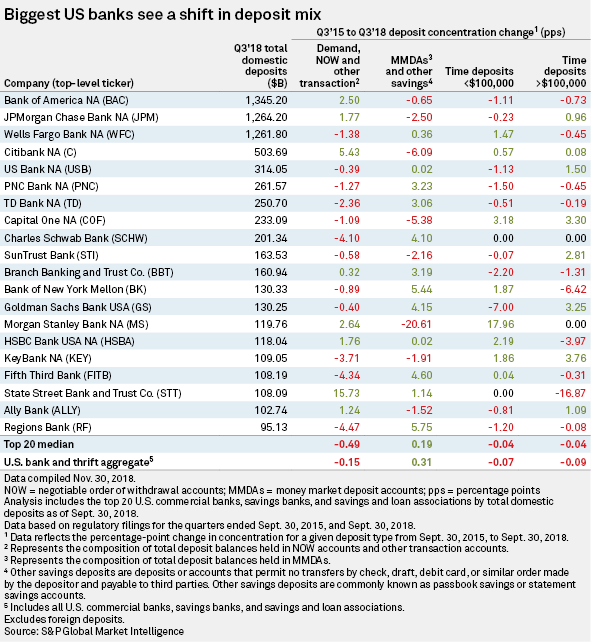 Banks' cost of funds increased 11 basis points sequentially to 86 basis points in the third quarter, a wave that has picked up more strength since the first quarter of 2017, according to S&P Global Market Intelligence data. What remains uncertain for the industry is the speed of that repricing and how quickly depositors move money out of noninterest-bearing accounts to those that pay interest. "The dam basically broke," said Christopher McGratty, managing director of equity research at Keefe Bruyette & Woods. He said the industry had tried to keep funding costs in check, but betas were "fairly high" in the second quarter and moved higher again in the third. As in earlier tightening cycles, the growth in noninterest-bearing deposits has shifted to certificates of deposits. "Banks [in the past] have been spoiled by excess liquidity," McGratty said. "Finally, earlier this year, those tailwinds became headwinds." Banks are dealing with requests from commercial banking clients "pretty much every day" to increase their deposit rates, said Chrystal Pozin, director of commercial deposits and pricing at Novantas, a bank analytics and advisory company. 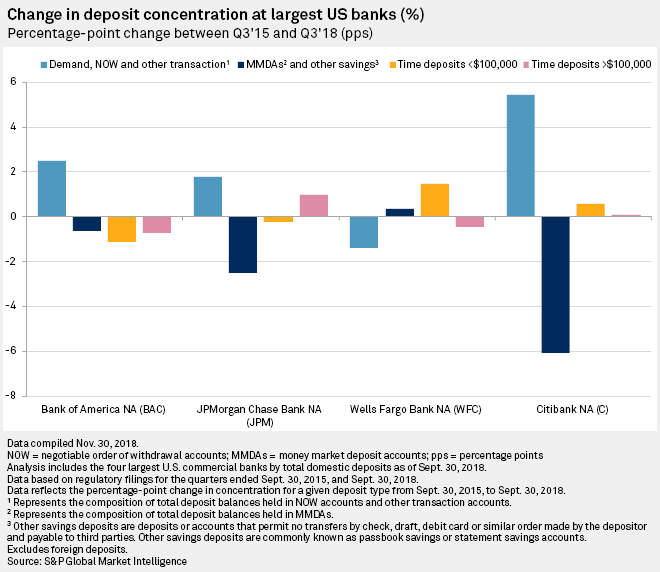 "Commercial deposit growth is approaching zero in aggregate, but you'll see a wide divergence in performance by bank," she said. "A number of banks [are increasing] their rates and betas to achieve basically flat growth in commercial deposits." The trend of rising interest rates and deposit costs shows no sign of letting up in 2019. McGratty said deposit costs in previous cycles continued rising even after the Federal Reserve stopped increasing rates and said that phenomenon could play out this time as well. 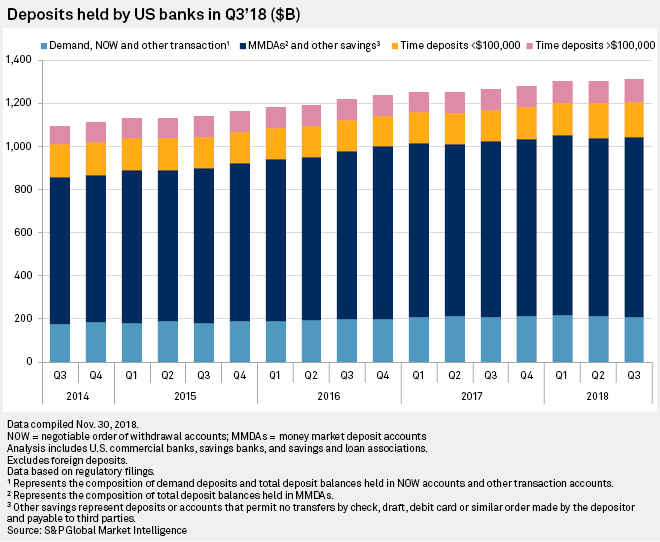 The rising cost of deposits could also put pressure on banks' net interest margins because competition has kept a lid on loan pricing and growth, said Rick Weiss, managing director and chief bank strategist at broker/dealer Ambassador Financial Group. "Funding costs are going up faster at this point than what is happening on the loan yields, and loan growth has not been great," he said. 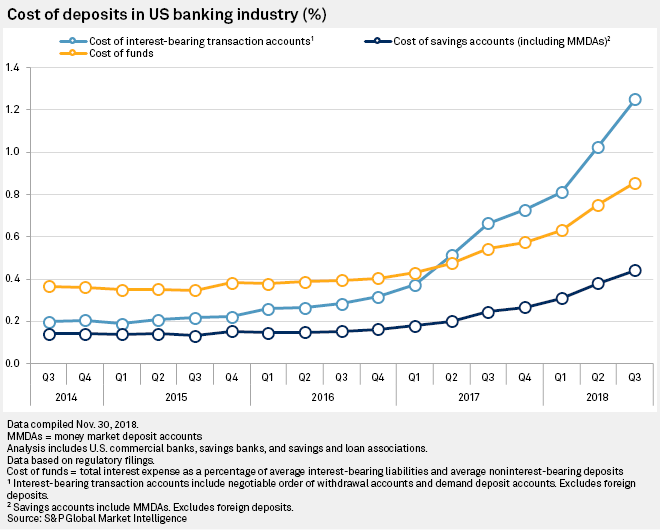 The rising cost of deposits comes at a time when the funding mix in U.S. banks has been slow to shift, at least at the market level. Novantas' Pozin said commercial deposit growth and changes at JPMorgan Chase & Co., Bank of America Corp., Wells Fargo & Co. and Citigroup Inc. — the four banks that account for half of all commercial deposit balances — have obscured the balance rotation that smaller institutions are experiencing. Some of the banks booking high commercial deposit growth are doing so without offering the highest rate, she said. These institutions have done a better job of figuring out the price they should offer to win the best deals and relationships, have an attractive suite of services and included deposit gathering in their employees' incentives and goals. Banks should prepare for upward momentum in deposit costs by enhancing their customer analytics to better grasp which accounts are truly rate sensitive, Pozin said. If banks have a "beta budget" they can deploy to keep certain amounts, they need to identify the accounts that will provide the best return at higher rates, she said. Click here to read S&P Global Market Intelligence's outlook for deposit betas and costs and here to set up real-time alerts for data-driven articles on the U.S. financial sector. S&P Global Market Intelligence offers a variety of tools to help analyze the deposit mix of a company. Click here for a template to help estimate the impact of deposit mix shifts on a banks "earnings at risk." Click here for a template that allows users to analyze loan and deposit composition at banks and thrifts.